Voicing the fears of refugees: Catherine Young’s new work explores the life of asylum seekers in Ireland. State of Exception, Project Arts Centre, Dublin. Photo: Fionn McCann. In times of serious uncertainty and crisis, some individuals may find their constitutional rights being stripped away. This state of exception, as philosopher Giorgio Agamben named it, is the inspiration for Catherine Young’s compelling new dance production. Young has sought clear and corporeal translation of complex ideas before, delving into the fantasies of Carl Jung’s Red Book for her 2016 work, Ultima Thule. In this seeking new production, she turns to imagery of bodies stuck in stasis, with criss-crossing wires suspended oppressively over head. The set, designed by Young and Darach Ó Ruairc, is not unlike a detention centre. In a vigorous quartet, where dancers Vanessa Guevarra Flores, Simone O’Toole, Marc Stevenson and Mufutau Yusuf roll and huddle in close formation, there’s a vivid sense of individuals under suspicion. To survive, as is made clear in Yusuf’s solo, which displays gestures of intense struggle, is to persevere. That seems to be what’s expected of those living within Ireland’s direct provision system, which houses asylum seekers while precluding them from working, driving and cooking. Conceived as a short-term measure, it’s been prevalent for 16 years. This production voices the fears of refugees living in Ireland. “You don’t know what people think of you. It could be dangerous,” we hear. But that alarm soon settles into something more draining, the tedium of passing time in a kind of limbo. 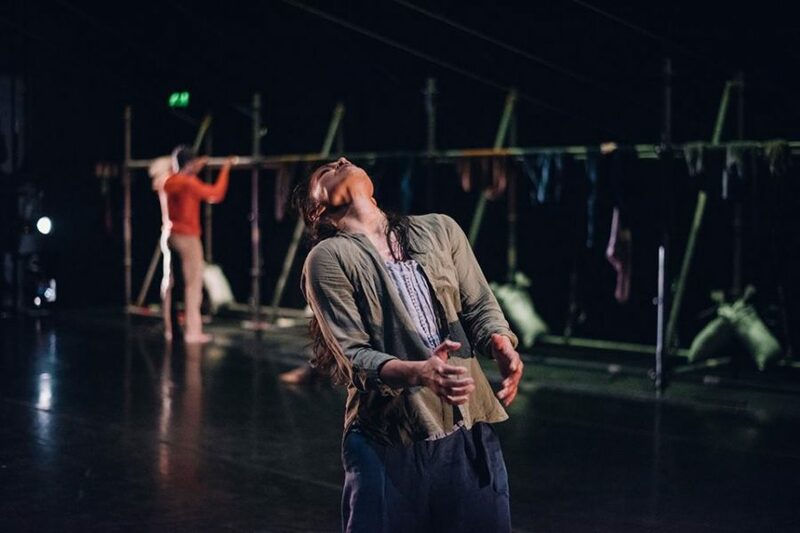 Young’s choreography even slows to reflect the infuriating monotony of serving an endless sentence, with Fiona Shiels’ sound design keeping us absorbed. In this despair, rhythm can still be found. Bodies erupt into fleet-footed steps, kicks and spins. Martin Scharer’s painstaking music, led by Brian Flemming’s drums, fuels the spectacle. But before long dancers return to postures of dejection, tinged by Vyvienne Long’s haunting cello and Jade O’Connor’s vocals. This upbeat movement, we realise, is just a memory of freer times. It may also be a performance of survival by asylum seekers bringing their cultures with them. Young briefly allows for scenes of liberation, ushering in a supporting choir and reinvigorating the dancers’ movement. This never lasts. Instead, this thoughtful trip to the void of direct provision refuses to be neatly resolved. That’s closer to real life, as the state of exception remains a concern, until removed by a combined effort across Irish society. For that reason, the immense presence of so many people onstage by the end is affecting alone. Young’s dance aches for solidarity if anything. State of Exception was at Project Arts Centre, Dublin, until March 24th. For more details, including future dates, click here.